I just attended my first Coffee with Cole jam session this morning. I, of course somehow managed to be fashionably late, but still had plenty of opportunity to sit in and listen to a great discussion. via A Review: Coffee with Cole | The Baron. We walk around with a shared value in DoIT that is focused on all of us and our growth. I want so badly to make sure that we as an organization find ways to support growth in a systematic way through professional development. It is a struggle to do that however — events are limited, interests are all over the place, funding is always an issue, and finding time is a complicated endeavor. With those thoughts as context, I’ve been discussing how important it is for us all to share our experiences at conferences, training events, and growth opportunities through participation through IT Travel & Training Reports. I’m not thinking of ultra formal reports that end up in a manger’s email, I am thinking about ways to share experiences widely so that all of us in DoIT and beyond can learn from each other. I am willing to share most thoughts on such events in the open, but I also understand that everyone isn’t comfortable with that, so I wanted to offer ways for both to happen. Travel and training takes time and money. Let’s work to maximize that investment across Stony Brook by sharing information. Let your peers know where you went, what you did, and what you thought by sharing your experiences in SB You and the “IT Travel and Training” group in Yammer. We’ve created a standard list of questions that can be found in the “IT Travel and Training” group in Yammer as a guide to sharing your experiences. Simply use those to create a shareable report in Yammer. 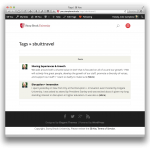 Or if you’re like me and you are already blogging your experiences using SB You, please add the tag “sbuittravel” to your blog posts, and then share links to your posts in the IT Travel and Training group. 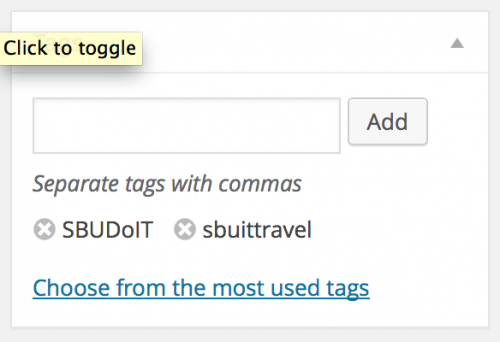 By using this tag, all results can be aggregated together into a single search result. When we all share, our contributions can be shared with the Stony Brook community and we can all grow and learn together.